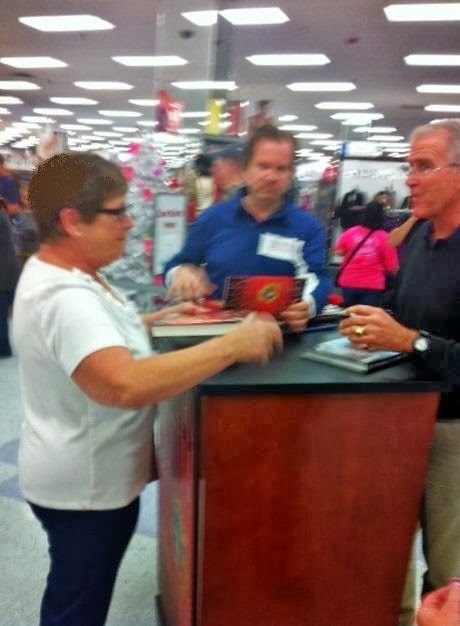 Grandma J goes to more book signings than movies, well almost. The thing is, there are people who make a difference in this world, some small, some big. Some write books, and give us the opportunity to meet them face to face and for just a few moments they become part of your world. Six years ago, in 2008, after learning that Sgt. John liked Ollie North's War Stories, Grandma J dragged him went to an Ollie North book signing. Then Grandma J went to another book signing in 2010 while Sgt. John was over in Iraq fighting for our freedom. No picture, but two signed books. Fighting for our freedom, With a bit of relaxation thrown in for good measure. Then, last month Ollie was back in town! Does anyone think that maybe he's stalking Grandma J? This time Sgt. 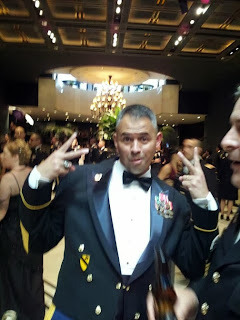 John, whose now a SGM, was with her. Grandma J loves this picture of two American patriots. Oliver North is 70 years young and still goes to war zones with the troops. SGM John standing by Ollie North's tour bus. This was a fun day and hopefully not the last time we have the honor of shaking hands with Oliver North. Yes, Grandma J shook his hand too....after all, if he can take the time to stalk her, that's the least she can do. We love him in our family. I am so thankful for your son who fights and defends our country. We are truly blessed to have him serve. I remember when Ollie North boxers were being sold with the slogan "we're behind you Ollie" or something. I had a crush on him. I think I was in middle school. He is definitely stalking you, Grandma J. I think of you and the family often. Sending lots and lots of love!